While most gardeners are aware of problems related to invasive weeds, many are unaccustomed to the threats posed by commonly acquired ornamentals, ground covers and vines, which are readily available. Not all of the plants in the garden are as well behaved as they should be. Let’s take a look at how to control these aggressive garden plants. So what are rampant plants exactly? 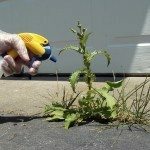 Sometimes plants become extremely aggressive growers and before you know it, they can take over the area, becoming nothing more than annoying, invasive weeds in the garden. This is what’s meant as being rampant. Although many of these plants have positive attributes, such as attractive foliage or flowers, if left uncontrolled, the garden will quickly become one grand display of rampant plants and nothing else. The ability to spread quickly may be great when looking for an effective ground cover; however, some plants with this characteristic simply do not know when to stop and will continue to spread until the entire garden has been taken over. While in some regions the plants might be appropriate in gardens, in other locations, the same plant could become problematic. A rampant plant can become invasive without control. The best line of defense for controlling rampant plants is to carefully research the growth characteristics of plants before acquiring them, not to mention before planting them in the garden. Be wary of any label or description that uses terms such as vigorous, spreading, fast growing, self-seeding, or good ground cover. Climbing plants and vines are traditionally favored by gardeners for their beauty, but many of these same plants can become aggressive garden plants. Pruning is the most effective way to thwart the destructive nature of climbing plants. Pruning not only prevents rampant growth and keeps vines becoming too heavy for their support structure, but it is also good for the plants, keeping them healthy and vibrant. The best time to prune flowering vines is after the flowers drop and during winter dormancy for most other climbers. In some cases, however, especially with ivy, removal is often the only alternative. The most common strategy to control rampant plants is through hand pulling and digging, which is fine for small garden areas and raised beds. However, in larger spaces, invasive plant removal may not be a pleasant experience. Hand pulling is only effective for a select few unless, of course, you dig deep, but digging is unlikely to be very effective either. Mulching plants is often an effective alternative to plucking out invaders. Thick layers can usually discourage plants from poking through the mulch, and those that do can usually be plucked out easily. Generally, it is better to apply some type of landscape fabric first, placing the mulch on top. Landscaping fabrics help restrict the spread of plants with strong rhizome systems. In order to control most rampant plants in the garden, including container grown, they must be taken care of prior to their setting seed. Seed is a method of dispersal by most all rampant plants. Oftentimes this means deadheading or mowing immediately after flowering to prevent seed production, which can be time consuming. Herbicides are a last-ditch effort in controlling rampant plants. These can be used in and around the home garden but special care must be taken to ensure it is applied safely and no other plants are destroyed. They should always be used according to the instructions and only for plants listed on the label. Using the wrong herbicide can destroy an entire garden, even years afterward. For the home gardener, products containing glyphosate are usually the most effective, but this could be costly. Also, while the treatment for one type of rampant plant may effectively eradicate it, at the same time the area could become invaded by other invasive weeds in the garden, which are unaffected by the herbicide.